I love the toddler stage. I think I am going to be so sad when all of my kids move through this stage because it is so darn cute. I love to do simple toddler play activities with my littlest (age 2) every day and spend a lot of time snuggling as well. I also tell my toddler that I love him a dozen times a day! Make sure that is on your "to-do" list too! As a busy working mom of three kiddos I often make really detailed to-do lists and have super high expectations for what we are going to accomplish in a day. A few times a week I have my toddler all to myself while my bigger kiddos are at school. We sometimes spend that time running errands, working out, cleaning the house, and doing fun crafts or activities for my Toddler Approved site. Lately though I've been trying to slow down and focus on the simple things my toddler wants to do during our special time together, instead of just my to do list. Not for the whole two hours, but for part of the time. This is the most obvious, but probably the most important. To be honest with you... sometimes I don't like sitting down to read with my toddler because my voice gets hoarse very quickly and I am usually so tired during the day that I start falling asleep when I read. I have to put a limit on how many books we can read in a row, especially in the afternoon. Sometimes to vary it up we also read outside, read while we are eating snack, or listen to a book read aloud on YouTube on my computer. We also invite friends over to read once a month and participate in our Mommy & Me Toddler Book Club. I love reading because it is fun, it helps us use our imaginations, it teaches my son some new vocabulary words, and it makes him love reading! We also love doing book inspired crafts and activities after we read. I collect book lists for kids over on Pinterest if you ever need any book ideas. If you have been a follower of Toddler Approved for awhile then you know we love to go on hunts! Hunts are such a great way to get kids moving and learning about new things in an active way. We even included them in our ABCs of Toddler Activities because we think all toddlers have fun with hunting. You can also tie hunts into all sorts of concepts - color matching, name recognition, number recognition, exploring the alphabet, etc. Recently we did a spring name hunt and a heart alphabet match & hunt game. Flashlight hunts are pretty cool too. I love doing sensory activities with my toddler but on a daily basis I am not organized enough to pull together anything really fancy. I love to grab our giant box of playdough, playdough tools, and a few cool playdough creating items and let my toddler have a blast while I either work sitting nearby or clean the kitchen. It is really cathartic to just sit down and play with him too. Making spaghetti or coil pots or playdough snakes is actually really fun. 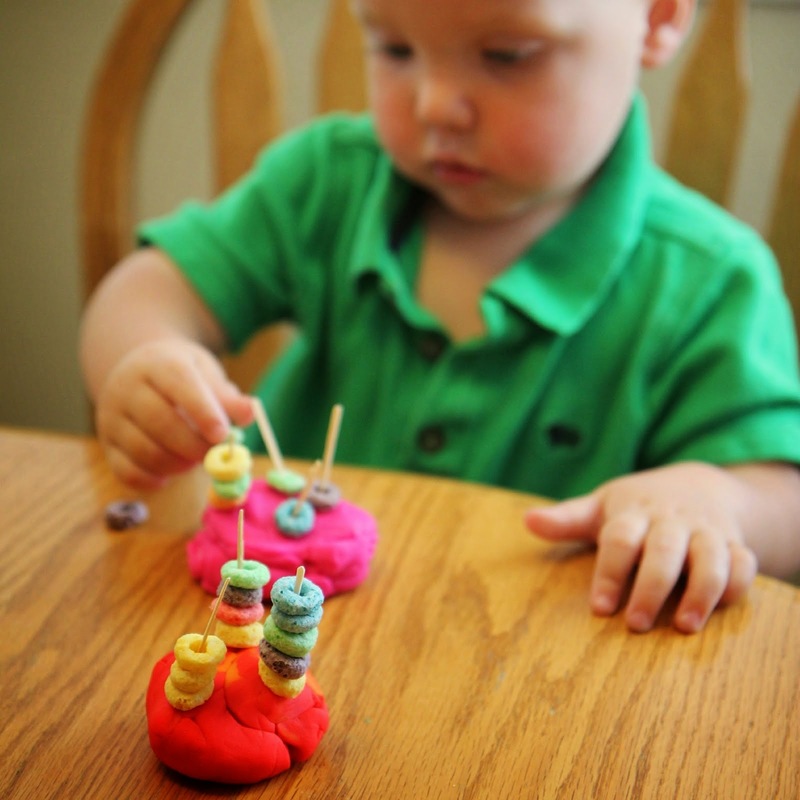 Sometimes we'll make playdough cupcakes, playdough & fruit loop threading, or playdough bugs as well. We go to the park or play in our yard to get ourselves moving every day. Sometimes I jog pushing my toddler in the stroller and we stop and check out different things around the neighborhood and sometimes we just grab our favorite ride-on toys and drive them around our cul-de-sac. When my big kids are home we sometimes do a family jogging club. I've also done our jogging club with just me and my toddler. He loves getting a punch on his card every time he runs a lap! 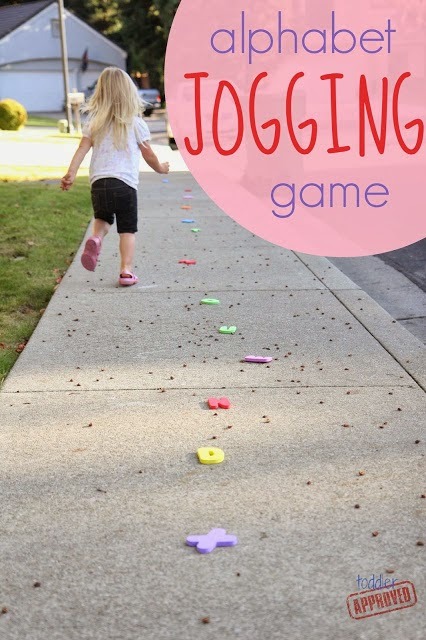 When my daughter was a toddler we would also do a simple alphabet jogging game. I love to get moving outside but sometimes when we are stuck indoors we also do movement activities as well! I like to adapt this stick movement game for my toddler and we play it together (even though he can't actually count yet). My toddler has a very active imagination. His favorite thing right now is to pretend he is a doctor and I am the patient. That mostly entails him checking me out with our Doc McStuffins doctor kit and wanting to give me band-aids. He also loves to dress up in some of our favorite Melissa & Doug dress up costumes. Another simple pretend activity that we do a lot is play store. This is really easy to set up. We just grab a kid table and our favorite cash register and put everything close by our toys and pretend we have a toy store. He thinks it is so funny when I pretend to be a customer and try and buy toys from him. My big kids have also taught him how to have a toy store with LEGO bricks as well. If you need any pretend play ideas I have several over on my Pretend Play pinterest board. Pretend play is such a great way to work on vocabulary development with toddlers and practice turn-taking and building simple social skills. We also try and fit sensory play into our day... though it doesn't always happen. Sensory play activities are often the easiest to set up and require little prep. I don't do anything fancy but love to pull out flour or cereal or rice or make up a quick batch of cloud dough. Shaving cream can also be a lot of fun with toddlers or pudding (if they are still in the edible phase). I also have an entire pinterest board filled with Sensory Play Ideas for Kids that are totally fun. Now you might be reading this and thinking... how in the world does she find that much time to do all of those things in one day??? One thing to remember is that toddlers have really short attention spans! At our house we might play playdough for 15 minutes, dress up and play doctor for 10 minutes, play with goop for 10-15 minutes (and clean up), read 2-3 books, and run around outside... and sometimes we've only filled up 45 minutes!! Sometimes that whole list takes an hour and a half depending on the day. Somedays when we are rushing around doing errands and pick ups and have a super crazy schedule, we don't get to all of these... but I love having a few ideas in my back pocket when we do have time. If we don't get time while my big kids are at school then we'll often include them in these activities in the afternoon after school. 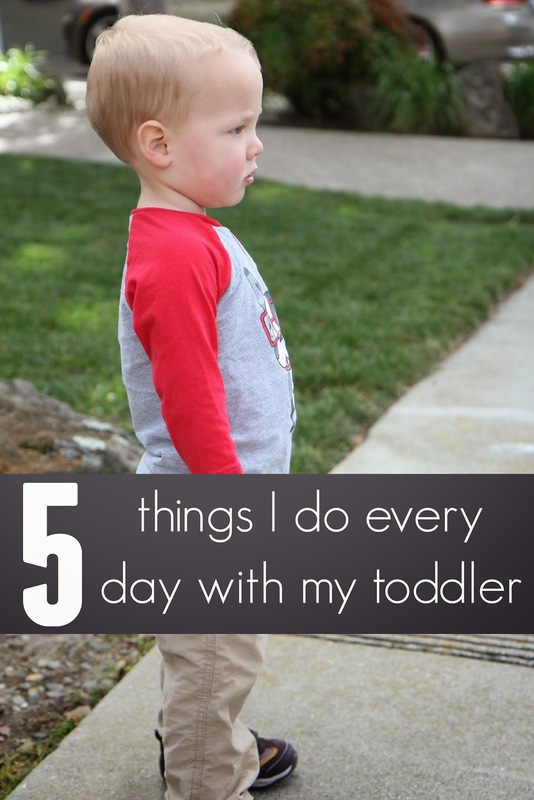 I'd love to hear what activities you try and do with your toddler every day? Are any of these on your list? Great post! I try to do each of these things every day I'm home with my son. But, I've never done a hunt. I'm adding that to the mix now. He'd love that!!! This is a really good list. 'Go on adventure' is one we strive for every day. It could be as simple as findings the biggest rain puddles to jump in, but it's a riveting adventure nonetheless! I love this list! 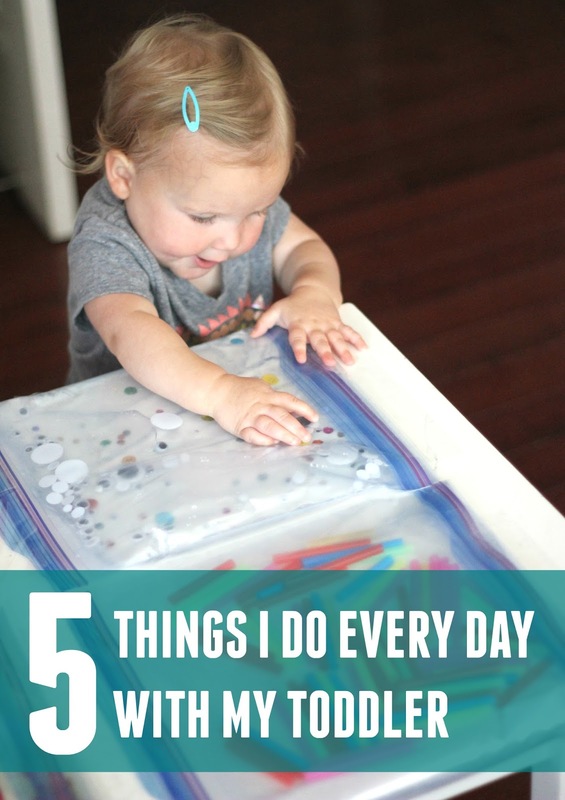 I've been looking for a set of activities to do each day (with toddler and then with baby) because I often feel like they NEED to do something different/stimulating and burn off energy. So helpful!! I never do most of these on the list. I seem to be always cleaning. When I get done with that I have to cook and it is just so stressful. I wish I had more time in the day to do things. It's amazing that people have time to do this. Stop cleaning! A toddler won't know if you have mopped or not. Put down your rubber gloves! To the lady who seems to be always cleaning: Let your toddlers help you clean. 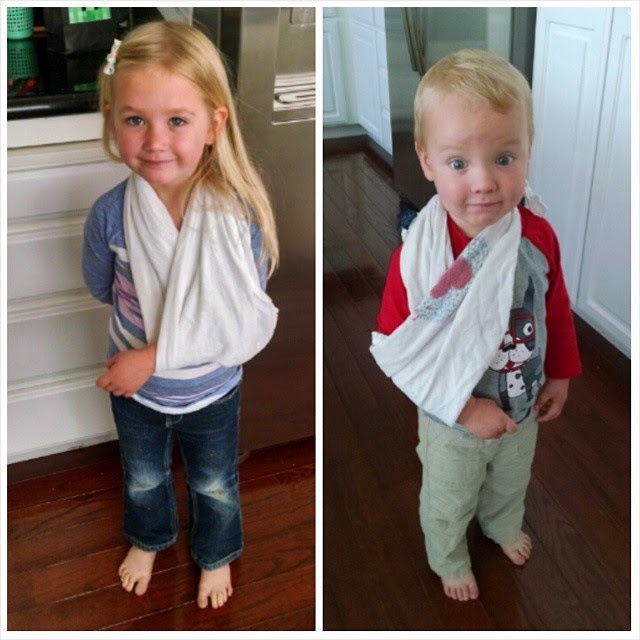 At the toddler stage, most of them want to help. Don't thwart that longing! Letting them help is not child labor, it's precious time together that's teaching your child to be helpful in the family unit. It helps him or her feel needed and proud of your trust. It begins to teach the child skills that will be useful for a lifetime. (It is never too early to begin learning those!) And just remember this: by letting your child help you dust or put things away or wash stuff you combine moving, sensory play, hunt, pretend, even reading. It's a win-win situation. Opposites attract so I like things neat, clean and disinfected and my spouse can tolerate a lot more mess. We had one child and I was wondering how the house could possibly be so messy with only two adults and one baby/toddler when the light bulb went on. My spouse would put interacting with us ahead of picking up, putting things back. I would spend that time correcting all this and house work was eating up my life. My own mother kept an immaculately clean home and I was trying to meet that standard, but she never spent any daily time with us, never played with us. Plus she had many children, close in age, so we played together and looked to her less for play. My son was an only child with no one else to play with but his parents. I changed. First, I had to ask my spouse to do a little more, but my expectations were lower than they were before. I decided to just clean to what I could tolerate instead of cleaning so I wouldn't be embarrassed if visitors (or my mother!) came over. I started spending time with my son. Now he is three and I have a newborn. I let him help me with some chores and I only do what is necessary to keep us out of total squalor! I found a middle ground, my home is not immaculate. But it's comfortable, safe, smells okay (lol! ), and we have enough clean clothes and linens. The rest of the time I spend with my boys- the baby is male, too. I'm the only girl in here, and I have no intentions of picking up behind everybody for the rest of my life. If you can't beat them, join them, but teach them, too! I hope you find your solution and spend time with your toddler before he/she is too old! Stop and smell the flowers- those will be precious memories for you! 20 years from now you won't say, Gee, I wish I'd cleaned more. You will be wishing you had played and read to your child more. I like your tips! I like read to my toddler as well, and I am happy that each time he likes this activity more and more. About moving, he moves a lot so when we go out, I have to run after him. We made an indoor "sandbox" using an underbed storage tote, rice and construction trucks. He plays with it in the kitchen so it can easily be swept up. It was messy at first, but after putting it away a couple of times, he learned to keep the rice in the box. He loves it! Such a great post!!! My 2 year old is obsessive about her Doc McStuffins kit these days. We wear a stethascope as a necklace- 24 hours a day. HAHA! Pinning! Great list! Will have to incorporate sensory play! I have 2-1/2 year old twins and we love to sing and dance! We talk about at least 1 letter per day - what it looks and sounds like and words that start with it. They love animals so we pretend to be different animals - how they "talk", move and what they eat. They also love counting - we count the stairs, pieces of food, items in a book, etc. These are some great ideas! I have a one year old and have started tot school with her. I can't wait to try some of these things. This is a great list! We do most of these things, but not every day. We haven't tried a hunt though. I think we'll have to try that one out tomorrow. You really doing good with your toddler. 5 things that you have listed above are very helpful and informative. All the things will help the kids to better grow. My daughter is 2 year old-now. Her every talk and many activities are surprised me all the time. When she was 11/12 months, she was starting to surprise me, because she is so talent I think. I always try to better with her. I will try some things like you with my child. Again thank you so much for sharing such a beautiful and informative resource. One last thing...I completely understand how much you can pack into 45 minutes! It's always one thing to the next! Hi! That is a great list. I read this and I am sure it's very helpful for 2-1/2 year old twins. Thank u for sharing. It's great!! Great ideas! I stay home with my son, 18 months! And I try to follow his lead as much as possible in the day ( between our chores) so that we can slow down and enjoy sensory and pretend play and active time also! Great read! I am a working mama of one and try to fit as much into every day as possible. One thing I love and find great value in is just taking at least 15 minutes a day to just sit and be in my toddler's presence. He might invite me to play with him during that time, which I do, but otherwise I just soak up his awesomeness :) Also, making art together is high priority in our house. Feel free to stop by beautifulbalancingact.wordpress.com and let me know what you think! We cook every day, my son is 21 months and adores anything to do with cooking! He mostly watches, and doesn't do anything with hot or sharp items, but he helps pour and mix. Happy times!